Having lived in Bangladesh for a lengthy spell, I became very well acquainted with the subcontinental-style roll. Our relationship eventually blossomed into a full-on love affair, leading me to frequent the top peddlers of grilled meat wrapped in freshly-baked naan, or better yet, parota, on a daily basis. The flatbread is baked in a clay oven in the case of naan, or lightly pan-fried with parota, and serves as a tasty vessel to envelop grilled chicken or beef. It’s almost like an Indian burrito. This is why I love them so much. 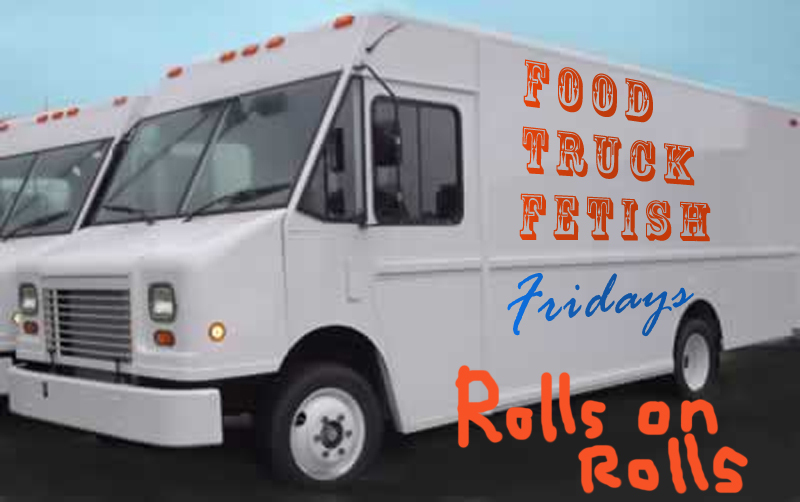 So when I stumbled up to the Rolls on Rolls truck and saw that they served chicken masala rolls, I knew destiny had once again come full circle. The chicken masala roll is massive. They asked if I wanted spicy, spicier, or spiciest. As a male, I succumb to every opportunity to mask true weakness with the power of chili pepper and opted for “spiciest.” They did not disappoint. This was the spiciest thing I’ve eaten in the past six months, and that’s a good thing. However, having experienced the zenith of meat rolls in their native setting, I can’t quite elevate the chicken masala roll to the lofty realm of the chicken reshmi kebab or chicken tikka roll. I think it’s probably because the chicken masala is prepared more like a curry instead of being flame-grilled and could easily be poured over rice for a fantastic dish. The flavor, though, is spot-on and it left me wishing for a larger stomach that would enable me to finish off the enormous beast. My favorite part of this meal was the samosa. Why? Because it was not really a samosa—it was actually the samosa’s tastier cousin, the shingara. Shingaras are infinitely superior to samosas because of their pastry-like casing, which approximates pie crust, and stuffed with an assortment of fillings—usually some garlicky mashed-up potato, lentils, savory spice, and if you’re lucky, some goat, lamb, or beef. Think of it as an Indian-style pot pie, in ball form, dipped into a boiling vat of vegetable oil resulting in a crisp, flaky morsel of savory goodness. In Rolls on Rolls’ case, they bake their samosas, which are also quite large, and assuage our media-bred conscience as we persuade ourselves that we have a healthy diet, when we actually practice quite the opposite. Oh who cares, just give me another damn shingara, I mean, samosa. To top the meal off, they included a chilled mango lassi, which not only tasted fabulous, but served as the fire extinguisher for the pungent chili explosion in my mouth. Just carpet bombed my palate with the spiciest Indian roll in USA from @RollsonRolls. Humanitarian aid came in form of samosa, mango lassi. Roll was good, samosa and lassi were great. How can people who spend six hours over a hot grill inside the back of a UPS truck be so nice? Rolls on Rolls are very nice folks and I enjoyed a nice chat with the friendly owner while waiting for the spice-bomb. Recommended dish: I highly recommend the samosa and mango lassi as a meal in itself. I might just go back and order five samosas, crawl back into my office, lock the door, and scoff down these delectable savories…with my shirt off. Just seems like the normal thing to do. I would also encourage anybody who likes spicy meat wrapped in Indian flatbread (which includes everybody, even vegetarians in denial) to try their chicken masala roll. Non-carnivores will also rejoice at their vegetarian options, which really comprises everything except the chicken roll. Website: N/A – they have a Facebook page, but you’ll have to look it up yourself. If you think I am just some fat slob who loves to eat anything and write positive reviews, wait until next week when I review Tasty Kabob. This entry was posted in Lifestyle and tagged DC, food, India, Indian, Rolls, samosa, truck, Washington by Troy Beckman. Bookmark the permalink.